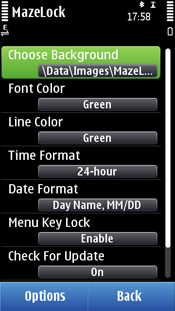 MazeLock free download for Symbian s60 3rd and 5th edition. 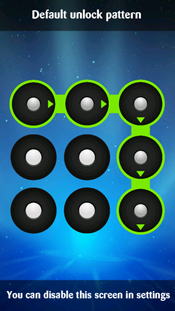 Watch carefully the default unlock pattern when you start the application! Set first your own unlock pattern by connecting some of the nine white dots together (There is a default unlock pattern pre setted). When you try to unlock your phone, you need to draw the same pattern exactly as you set. You can also protect your side bar slider key -- double click the menu key to lock the phone. When the phone is locked, single click the menu key to show you the lock screen with large time display, if you only want to glance at the time, signle click the menu key again to turn off the light to save the battery! 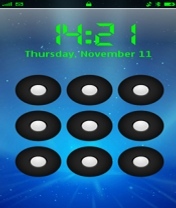 The lock screen can be easily configured according to your own preference: you can download plenty of backgrounds for free, the date and time display can be changed, the color of the text is also configurable. Hi, I made a very stupid mistake; I installed the app, but I didn't look at the default lock pattern and I didn't set my own unlock pattern and of course now I can't unlock the phone, can you please help me with this problem? thanks. It's full of win! Thanks! If by free you mean you have to pay to turn it on the second day, then yes, it is that kind of free. Looks like it drains a bunch of power. cool look though. 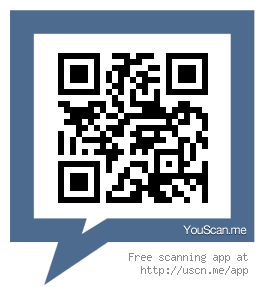 Is compatative in my Sony ericsson Satio u1i..? Date: 9 aug 2012. Downloaded. Good. NEw version available on Ovi. Lock gets activated immediately post installation. So be careful. Ensure u have learned the default unlock pattern. which in cell phone key layout is 12369. This is trail version. So only one pattern works. To set new pattern, need to download full version from Ovi. Charges Rs 15.